How Much Does a Physical Therapist Make per Year? Often referred to as PTs, physical therapists often participate in all sorts of rehabilitative programs meant to improve mobility, increase strength, relieve pain, and correct or improve conditions that result from either diseases or accidents. They have a very comprehensive job description, having many duties around the hospital. So, what is the average physical therapist salary? A very important part of many rehabilitation processes, physical therapists generally work out of hospitals, clinics, and nursing homes. Most of their time is spent actively working with patients, while on their feet. Since no job has an actual fixed salary, the same is the case for the salary for physical therapist. There are multiple factors which influence pretty much all salaries out there. Some of these are more minor, only influencing the salary by a few hundred dollars. Others, meanwhile, can cause wage fluctuations in the range of several tens of thousands. While some may accuse some employers of being unfair because of the aforementioned fluctuations in the physical therapist salary, they would, in fact, be wrong to do so. After all, each state has its own economy and physical therapy needs. And each industry requires physical therapists to do different tasks. For example, a traveling sport physical therapist working for the NBA or the NFL out of Utah or Illinois with more than ten years of experience would have a far greater salary than an occupational physical therapist working for the army or for a school out of Colorado or Georgia for slightly over five years. The average salary of a physical therapist is perhaps influenced the most by the physical location of employment. Throughout all of the United States, people with the physical therapist salary need to be licensed. They also need a degree as a doctor of physical therapy. With a median yearly salary estimated at $84,020 by the Bureau of Labor Statistics in 2015, the job outlook for physical therapists is highly optimistic – it is estimated to grow 34% by 2024. The state or area in which a job is located can generate a difference of more than $65,000 in the salary for physical therapist. 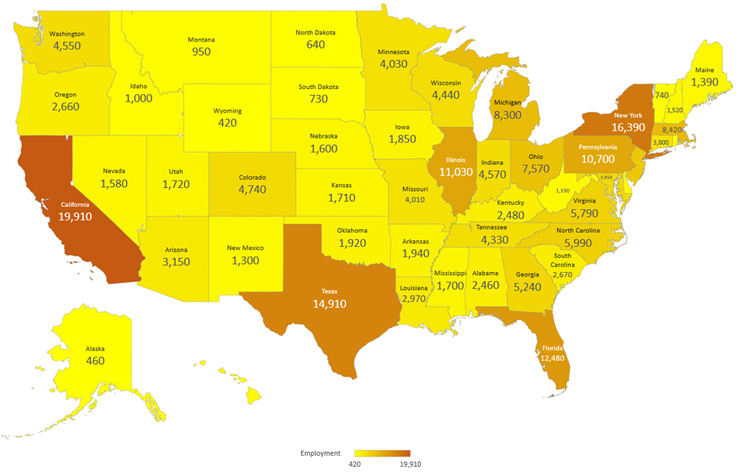 As mentioned before, each state has its own economy and physical therapy needs. For example, San Diego, CA will undoubtedly need more people with the physical therapist salary than Charlotte, NC. Without further ado, here are the states and the metropolitan and non-metropolitan areas with the highest salaries and employment rates for physical therapists in the US. According to Payscale.com, the salary for a physical therapist in Canada ranges between C$45,597 and C$92,200, or US$33,758 and US$68,250 per year. The median yearly salary for this profession is set at C$61,038, or US$45,192. Bonuses can account for C$2,750 (or US$2,035) of these amounts. The same source as above reports that almost half of the physical therapists in Canada have less than 4 years of experience. According to the same source, only 8% have more than 20 years of activity in this field. Therefore, it seems more experienced professionals tend to leave physical therapy and move on to other medical fields. Payscale reports the median salary for a physical therapist in UK at around £30,000 (or US$36,773) per year. However, it seems that professionals in this field don’t have health insurance among their benefits. The physical therapist starting salary in UK goes from £16,015 (or US$19,642). In time, experienced physical therapists can earn as much as £59,598 (or US$73,105). Most professionals in this field have 4 years of experience or less. Physical therapists in Australia earn AU$50,420 (US$36,354) per year on average. Most professionals in this field have less than 4 years of experience. The physical therapist starting salary is set around AU$48,595, or US$35,051. However, a physical therapist in Australia can earn up to AU$88,638 (or US$63,933) in time. Bonuses can sum up to AU$5,034 (or US$3,631) per year depending on experience, the amount of hours worked, responsibilities, and achievements. It seems like Queensland is the best area to work as a physical therapist in, with salaries ranging from AU$44,253 (US$31,921) to AU$87,615 (US$63.195). A physical therapist working in New Zealand will take home, on average, NZ$66,000 (US$45,915). The salary of a physical therapist ranges between NZ$39,149 (US$27,243) and NZ$113,073 (US$78,687) depending on experience, responsibilities, achievements, etc. Bonuses can sum up to NZ$1,017, or US$708, per year. India’s physical therapist average salary is set at Rs359,999 (or US$5,287). An entry-level professional can start from about Rs118,066 (US$1,734) per year. In time, a physical therapist in India can earn up to Rs715,171, or US$10,507. However, most professionals tend to leave this field after 10 years or more. The median salary of a physical therapist in South Africa is set around ZAR240,000, or US$17,550. Professionals with a history of more than 20 years in this field typically earn between ZAR162,000 (US$11,848) to ZAR261,018 (US$19,092). However, more than 70% of the physical therapists in South Africa have 4 years of experience or less. They typically bring home between ZAR118,783 and ZAR288,992, which translates to US $8,688 – $21,136, per year. 33% have medical and vision insurance, while 67% don’t have any type of health benefits. Interestingly, the level of experience of each employee doesn’t affect the physical therapist salary all that much. In fact, it can only make up for a wage increase of around $20,000 over more than twenty years on the job. Several reasons are usually held accountable for this fact. First of all, the training and learning for this profession is done before starting down the career path. Unlike medical specialists or other healthcare practitioners, people with the physical therapist average salary don’t usually learn more techniques or get better throughout their careers. Instead, the starting salary is fairly decent thanks to the educational and formative path that must be taken before practicing the profession. 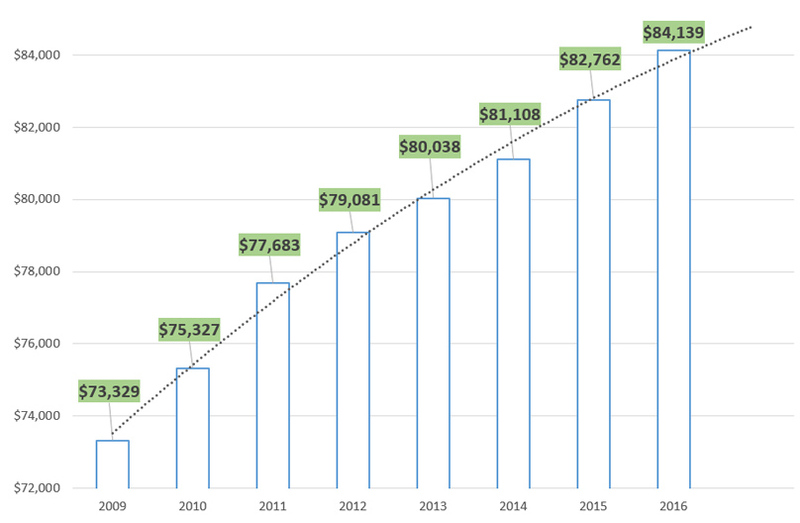 According to payscale.com, the average entry level physical therapist starting salary in 2014 was somewhere around $66,000. For someone just beginning down that career path, be it as a sports, pediatric, orthopedic, or another type of physical therapist, the average salary path is as follows. Please note that we added no bonuses, profit sharing, or any other extra sources of income to these calculations. The other way experience helps when it comes to the physical therapist salary is in that it offers more employment opportunities to people. For example, a physical therapy assistant, aide, or tech, could far more easily become a travelling animal physical therapist than someone without experience in the industry. Speaking of the industry, it can also prove to be quite a significant determining factor in relation to the ranges the salary for physical therapist can reach. The physical therapist average salary can make up for wage differences of more than $20,000. And, unlike experience, these are available from the get-go. In the table below, you can find a series of tables documenting the industries someone can get hired in which offer the highest physical therapist salary, as well as the highest levels of employment. Practicing their trade in a wide variety of settings, physical therapists spend a great deal of time on their feet. Regardless if they have an aid, a technician, or any number of assistants, physical therapists are always very busy and are almost constantly on their feet, helping their patients make progress. The average physical therapist work week is generally around forty hours long. Some of these hours can very well include evenings, weekends, and even holidays. Of course, their work schedules mostly depend on their employers’ policies and on their patients’ agendas. According to payscale.com, the average physical therapist salary can be raised by more than $15,000 in a year. This can be done via extra sources of income, such as bonuses, commissions, and profit sharing. In fact, these three sources can add an extra $12,000 or $13,000 to the salary of a physical therapist. Some employers sometimes choose to pay overtimes by the hour. As for the benefits packages which come with the salary for physical therapist, about 80% of all physical therapists get full medical insurance, 62% get dental, and 47% get vision, while 18% get no type of insurance whatsoever. Last, but not least, a good 401(K) plan and a decent number of vacation and sick leave days top off the list. The job outlook for people with the physical therapist salary and job description is highly optimistic, according to the Bureau of Labor Statistics. In fact, by 2024, the rate of employment for physical therapists is estimated to go up 34%. That is much higher than the average for all occupations in the United States. Some of this is caused by the constantly increasing elderly population wanting to stay active longer and longer, while chronic conditions such as obesity and diabetes are also responsible for some of this increase. The increased prevalence of cardiovascular incidents such as strokes is also a determining factor. The constant advancement of medicine and medicinal techniques can also be at fault. With one of the best therapist salaries in healthcare, physical therapists have been seeing a huge popularity increase in the past few years. Determined by many things, the physical therapist salary can easily drive people to sign up for a doctorate, to travel for work, and, most importantly, to try to figure out how to become a physical therapist. All the tables in this article are courtesy of the Bureau of Labor Statistics.